Collection of S G Moriarty , Dee Why, 1970, (illus.). This mask can be seen with other objects on page captioned: 'Sepik artifacts with a display of hooks', in the house of Stan Moriarty in Dee Why. Melanesian art , Sydney, 1966, 11. cat.no. 99: Mask board. Carved in relief, curvilinear design. Cassowary feathers and fibre tassels. 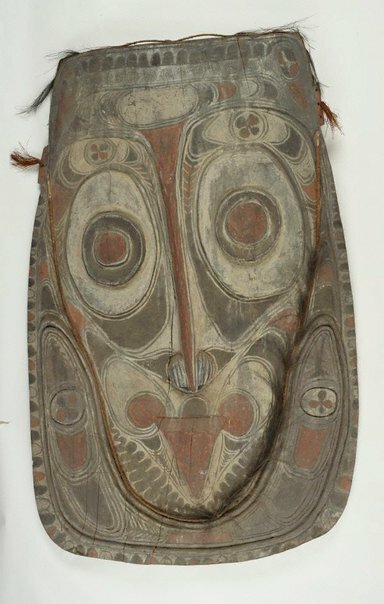 Wood, painted white, black and red, 56h x 37w, Jiginimba (north of Korogo), Sepik River. Coll: S.G. Moriarty. M974.